18 Holes on 25 hectares; you must be joking I thought! 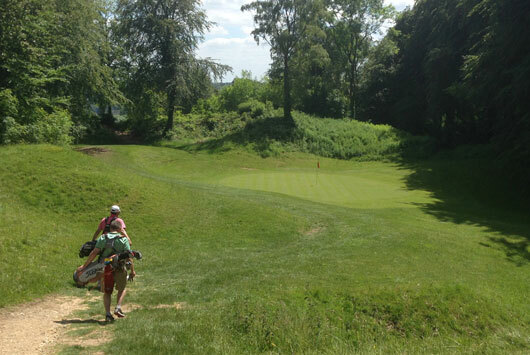 For years Robin has been telling us about Painswick Golf Club in the Cotswolds. Last week we finally managed to get there to see it for ourselves; it didn’t let anyone down. After a monster breakfast we were thrown in at the deep end, a 220 yard par 4 which on the scorecard looks like a very friendly start; wrong, it plays 25m up the hill to a blind green with a 15ft quarry in front of it. It must be one of the shortest holes that is virtually un-driveable. So the first hole breaks some our ‘rules of golf architecture’, and so does almost every hole after that, there are blind par 3’s, shared fairways, crossing holes, and last but not least, holes playing over roads and even cross roads. Having said all that it was as much fun as I’ve ever had on a golf course, for every shot there was a choice of 3 or 4 clubs, and for every club there was 3 or 4 shot options, you definitely have to think your way round this course and I look forward to returning knowing it a little better, I’m not sure if that’s a good or bad thing to be honest, blissful ignorance helped me a few times the first time round! I often wonder what the most strategic golf course in the world is. In my opinion it’s not the likes of The Old Course, Oakmont or Royal Melbourne. The answer lies much closer to home; anyone’s home in fact, your local club can be transformed if you play it cross country style; nowhere would a strategic thinking golfer prevail more. For those who don’t know, the fundamentals of cross country golf are this: Tee it up, agree a distant green with your fellow players and plot your way there. It may involve going round forests, over outcrops of trees, streams and ditches, across fairways and bunkers to greens unlikely to be designed to accommodate shots from all directions. 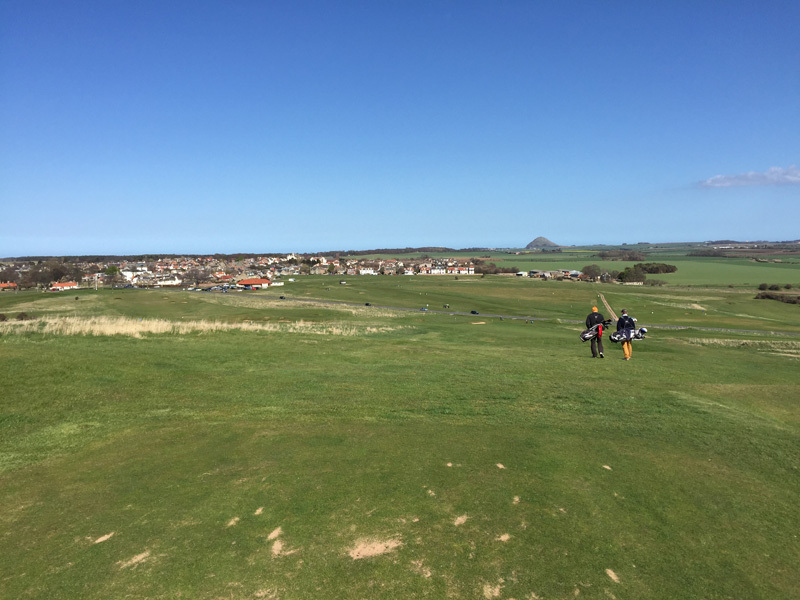 Your shot making skills will be tested to the extreme, not many standard courses will require, draw’s, fades, lob shots and punches all on the same hole; it’s this that makes cross country golf so great, after all, variety is the spice of life! Very few people would play a cross country hole and only think about one shot at a time, like chess you should think at least 2-3 moves ahead. Many club players could benefit from applying these strategic thoughts to their usual game; too often I see people get the driver out on par 4’s without even looking what lies ahead, there is little else on the golf course as rewarding as making a strategic birdie exactly the way you pictured it in your mind the night before. Next time you are at your club late one evening why not test your strategic brain cells and play to a different green? Please remember to keep it safe though; keep an eye out for other golfers and playing over roads and buildings is definitely not recommended! We’d love to hear your cross country golf stories so please tweet us @eurogolfdesign; the most interesting will win a Nike hat signed by Paul Casey! I am back in the office after a great holiday driving from Calgary to Vancouver. Whilst there I was lucky enough to play a couple of Stanley Thompsons finest golf courses. Born in Toronto in 1893 he was one of 4 brothers and 5 sisters, all the boys became good players (two were professionals) after learning the game whilst caddying at Toronto Golf Club. Thompson then began a career in course design. 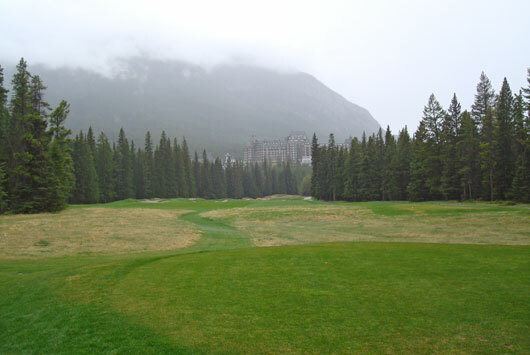 After starting a family design and construction company and working on many courses he designed Banff Springs in 1928, Canada Pacific funded the project and it is rumoured to be North America’s first million dollar build. It was a course that I had known of for many years and it didn’t let me down. Every hole was framed by spectacular scenery and the bunkers were incredible, apparently, like many other designers of his era, Thompson like a drink or two, I think you can see that in some of his work; the 15th tee is something else! There are many great features that I hope to use in designs of my own in the future. 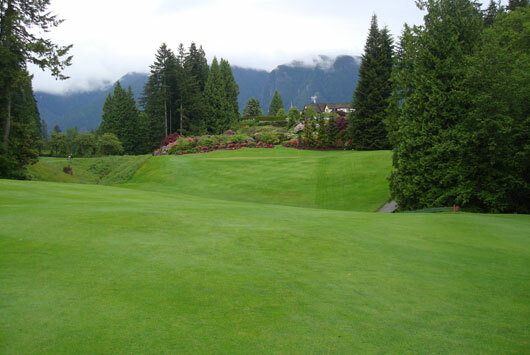 Once in Vancouver I managed to organise a game at Capilano Golf and Country Club with the assistant superintendant Michael Newton. This was another great example of Thompson’s work and the course has on the whole stayed true to the original design, recent renovations have also reverted back to original features where aspects had changed slightly. The course was as good as I have played anywhere and was in immaculate condition, although we had some rain and it was pretty cloudy the photos are still an explosion of colour! I think it’s a great reflection of the work that is done there. My golf was pretty ropey so I look forward to getting back there one day and playing a little better, thanks for the thrashing Mike! 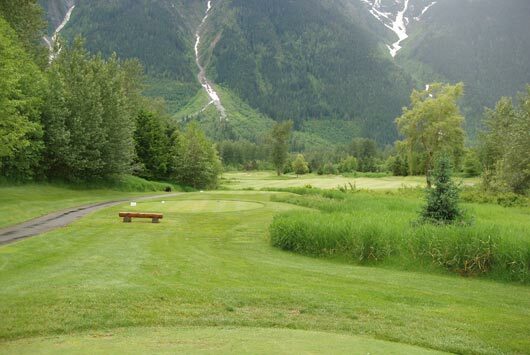 Whilst in Whistler I was also fortunate to play at Big Sky designed by Bob Cupp. Again the course was great and the scenery unbelievable. 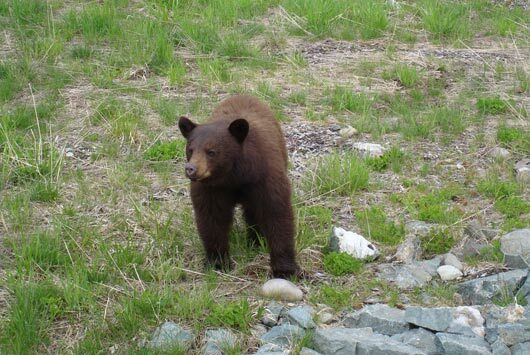 Sustainable golf development is a hot topic at the moment in Europe, this was a great example of a course fitting seamlessly with its surroundings; just ask the bears that we saw on the 4th tee! That’s enough from me but all that is left to say is that the golf I played in Canada was as good as any country I’ve played in, that’s before you take into account the wildlife, rivers and 9000ft mountains that surround you! I must also thank Steve Young at Banff, Chris Wallace at Big Sky and Brad Burgart at Capilano for organising the golf, I definitely owe them all (and some others) a few drinks when they are next in the UK. Above: The 4th at Big Sky with Bears approaching! 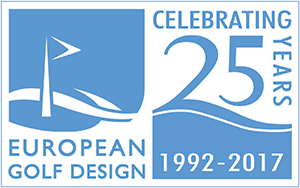 For the past couple of years I have been lucky enough to be studying a vocational qualification in Golf Course Design with the European Institute of Golf Course Architects (EIGCA). The course covered a wide range of subjects from the history of the game to the latest design and construction methods and modern sustainability issues, over the 2 years we completed both written assignments and design work covering these topics and more. The recent EIGCA conference and AGM in Malmö provided the setting for me to present my final design project, this work has received a majority of my attention over the past 6-months (just ask Alaina!). I arrived on the Monday afternoon and after some lunch was able to present my work; after a couple of hours with Ken Moodie and Peter Fjällman I was able to relax with ‘en stor stark’, I am still waiting for my final grades so maybe that was a bit premature! With the assignment out of the way there was still plenty to learn during the week that followed. Ross, Robin and myself, along with 35 others from the Institute started the ‘Raising the Standard of Sustainable Golf Course Development’ seminars. This is a programme developed by the EIGCA along with the Golf Environment Organisation (GEO) consisting of 33 hours of web based seminars, having just completed a 2 year course what had I let myself in for!? Joking aside, I’m sure it will prove to be beneficial to us all. After completing these seminars, members should have the knowledge and information to complete a case study, if successful our names will be added to the EIGCA Sustainability Register. Before and after these seminars was some Golf. First up was at the PGA National Links Course. The course is a great example of modern golf development, luckily for me the growing season in Sweden is only a couple of weeks old and the rough was short enough to find the errant tee shots! 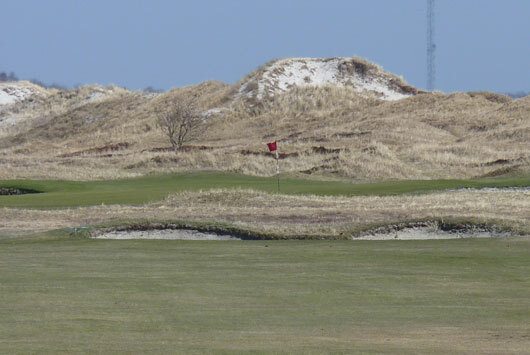 In the days that followed the Presidents Cup was contested on rounds at Ljunghusens (1932) and Falsterbo (1909) Golf Clubs, these two great courses are set about as far south as you can go in Sweden and need a blog of their own to do them justice, the wind was blowing 3-4 clubs, something told me that this was a calm as it would get! After a couple of days of hitting the ball well tee to green I suspect that Ross’s and I scores were somewhere mid table of the 65 or so golfers, Robin did rather better winning the overall event after an impressive total of 74 stableford points. I think the trophy will be displayed with pride in his office! The AGM took place on the Thursday, it was an opportunity for important issues to be discussed and new President Peter Fjällman was voted in. He has taken over from Rainer Preissmann who has done an excellent job over the past couple of years. After the AGM it was time for the Industry Partners dinner. It was a great opportunity to meet and catch up with friends; I am really looking forward to working with them all in the future. 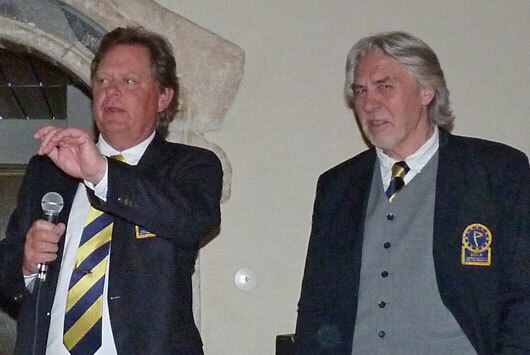 The morning after the night before started with a series of presentations on Nordic golf. There were some great speakers and the courses in the area are as good as any in the world and should be on the to-do list for any golfer. The rest of the day was filled with some interesting talks from EIGCA members and other industry experts. Later that evening I returned home but many stayed for the Presidents dinner, I hear from Ross and Robin that it was a great evening and there is a lot of optimism for the future. It was a fantastic week and I’m looking forward to next year’s event already. A big thank you must go to Julia and Sue for all their hard work! 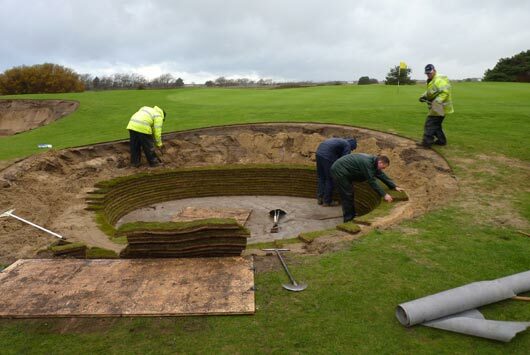 Have you ever wanted to build your own revetted bunker? Well now is your chance, below is a rough guide, if you would like more detailed information, please do not hesitate to contact us! This is important! Check you are not working near irrigation lines or other services. If you are, mark them with clearly with flags or something similar. The location and elevations should be clearly marked using stakes and paint. Remove the turf and store it if it is in good enough condition to be reused. After this the topsoil can be stripped and stockpiled. Bunker Complexes include the bunker site and adjacent mounds and hollows. The shaping is normally carried out using a backhoe with swivel bucket or small excavator. The final shaping needs to direct water away from the bunker as erosion and contamination of sand is costly. All bunker subgrade should be properly graded, raked, free from all weeds, compacted and be shaped to a uniform level 100mm below the desired finished grade. The turf may now be placed around the bunker edge. Start by laying the bottom layer around the base of the bunker. The slabs should be laid one on top of the other (offset like brickwork) until the desired height is reached. 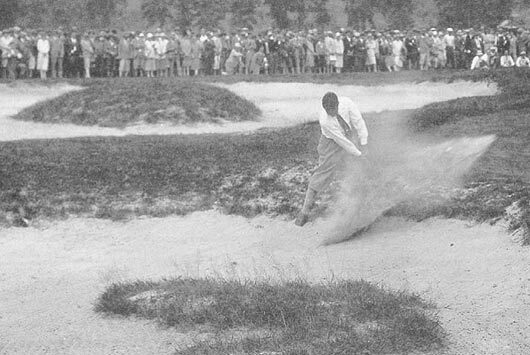 As a general guide, greenside bunkers should be at an angle of 135°. To achieve this each slab should be laid 40mm further back than its predecessor. For fairway bunkers a slightly more forgivable face angle of 145° is desirable (slabs laid 60mm behind each other). It should be noted that if the face is too steep it is likely to collapse. As the turf is laid, the over excavated area should be filled using native material. The bunker construction detail illustrates this clearly. The turf should be laid around the extremity of the bunker shape gradually getting lower until the desired back lip height is reached, this should be low enough so all golfers can step in and out of the bunker easily. The next step is to excavate a hole for the soakaway. This should be dug by hand in the lowest part of the bunker and measure 1m³ (this may be adjusted in accordance with the surface area of the bunker). If perorated pipe is required then It should be installed using the herringbone method prior laying the turf slabs. – The bunker floors should be cleaned out and graded smooth. All cuttings from coring and edging should be removed along with any stones that lie on the bunker floor and edging. – No ridges or barriers shall remain on the subgrade that inhibits the flow of water. The final phase of coring is the compaction of the bunker floor, this may be done manually or mechanically. 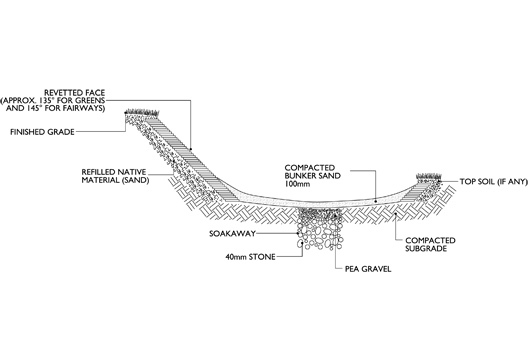 – The stockpiled topsoil should then be re-distributed around the bunker to a level consistent with the existing golf course and the specified turf can then be laid up to the revetted edge. On completion sand should be placed in the bunker to a finished depth of 100mm. Layers no more than 50mm deep should be raked into place and compacted. The sand at the sides can be a little deeper to prevent the ball getting trapped at a right angle between the revetted face and sand. The construction detail and photo below should make the above a little clearer! Since studying for a VQ with the European Institute of Golf Course Architects I have become familiar with the design work of a Philadelphian named Albert Warren Tillinghast. Known affectionately by his friends as ‘Tillie’, he is recognised by many as one of the most colourful and outlandish characters of the games’ history. After his death in 1942, for more than 30 years Tillie became a forgotten man. It was not until 1973 when Frank Hannigan and his colleagues from the USGA realised that four of their ten tournaments in 1974 would be played on Tillinghast courses. His story would finally be told. Albert Warren Tillinghast was born in Frankford, Philadelphia on May 7, 1874. His father founded and managed a very successful rubber company operating plants in Philadelphia and Baltimore. Albert grew up with little discipline and was largely left to his own devices, he never lasted long at any school he attended and spent much of his time playing a street version of rugby with local gangs. After a few years playing cricket, Tillingast eventually fell in love with the game of golf. During the 1890’s he travelled to Scotland with his family. 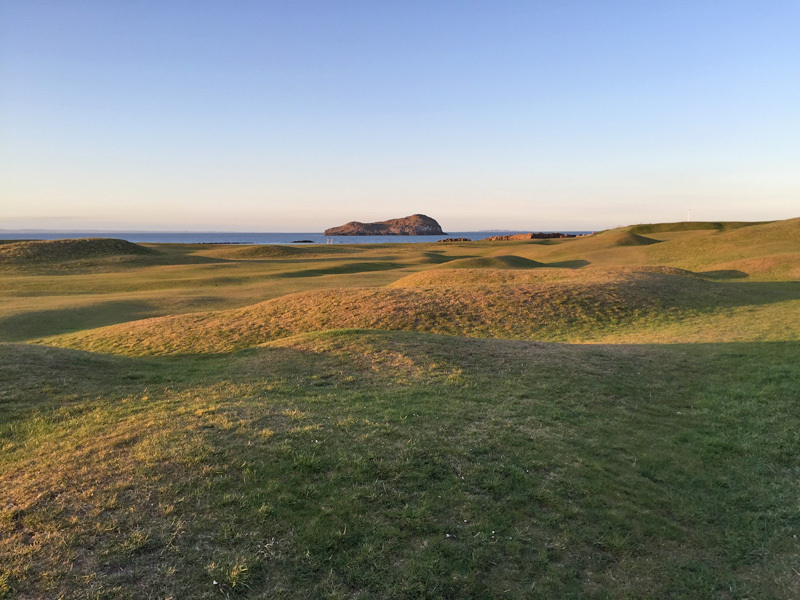 It was here that he met and received golf lessons from Old Tom Morris, he went on to become a very established player and featured in many of the early majors. Tillinghast returned to the US. He was married at the age of 20 and became a typical sporting gentleman of the ‘roaring twenties’; he was a heavy drinker, lavish spender, master talker, flashy dresser and talented pianist. His magnificent waxed moustache became his trademark. In 1907 a family friend named Charles Worthington invited Tillinghast to lay out a course on the Delaware River at Shawnee. The course proved an instant success and although it was not hugely influential at the time, it was whilst working on this project that, at 32 years of age, he had found a career. Tillinghast was part of what has become known as the Philadelphian School of design. In the years leading up until World War I a group of men from Pennsylvania dreamed of building first rate golf courses and went on to do so. The other primary members of this group were William Fownes, George Crump, Hugh Wilson, George Thomas and William Flynn. They often met and discussed course design. One of George Crump’s most famous holes, the 7th at Pine Valley, or Hell’s Half Acre as it is known, is often accredited to Tillinghast. He went on to design some of America’s greatest golf courses including Winged Foot East and West, San Francisco Golf Club, Somerset Hills, Bethpage Black, Baltusrol and Quaker Ridge. Tillinghast also wrote on the subject of course design extensively for Golf Illustrated, the American Golfer, the PGA of America and numerous other leading journals of his era. It is widely thought that many of his design principles formed the foundation for the development of the golf courses we see today. In 1937, Tillinghast moved to Beverley Hills, California, where he opened an antique shop. He started off selling personal belongings that he and his wife had collected over the years. After a couple years trading it is said that a majority of the movie stars either knew him well or bought from him. Albert Warren Tillinghast had a fatal heart attack on May 19, 1942. He was buried at the Woodlawn Cemetery in Toledo, Ohio. 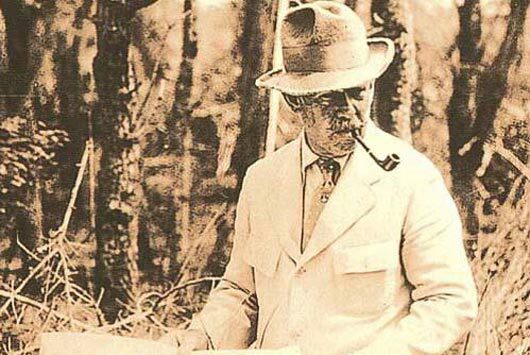 All though by no means a prolific designer, Tillinghast is regarded by many as the best of his era. The sheer number of national and international tournaments that have been held on Tillinghast courses is testament to the quality of his design work. Bethpage, Baltusrol and Winged Foot have all hosted recent major championships. I am confident, whether they are aware of it or not, that every golf course architect operating today has been influenced, at some point, by the work of Albert Warren Tillinghast. Having decided to ride to The Twenty Ten Course at Celtic Manor for charity a few months ago the Monday morning start date was suddenly with us, after months of training, riding from the European Golf Design office to the Course should be no problem, after the training I did however, this was going to be very, very painful! Gary was in much better shape than me and feeling confident. Having packed a tent and some cereal bars the night before we were almost ready, just one thing to do in the office before we left, print the route (very organised). With that done we set off on the road to Malmesbury (78 miles) where we hoped to spend the first night. After a steady start we quickly knocked off the first 25 miles, whilst having a drink it quickly dawned on me that we were not even 1/3 of the way through day one. Ouch. After another 23 miles we stopped for a late lunch – Super Noodles in a field – very tasty. It was almost 4 o’clock before we picked ourselves up again and had to get a move on as we still had 30 miles to cover before Malmesbury and we didn’t want to be setting the tent up in the dark. Finally we made it – the last 60 miles of day one were very painful! We pitched the tent and headed straight to the pub for a well deserved pint and some food. After the pub Gary went to the Co Op to buy some Bananas and Vaseline. Most men would be embarrassed doing that, Not Gary though. I was hiding under my hood outside the shop. After a surprisingly good sleep next to Gary in a tent which is small at the best of times we headed off on Day 2. 71 Miles to go. We were reliably informed that the road to Gloucester was hilly, after that apparently it flattened out to Celtic Manor. 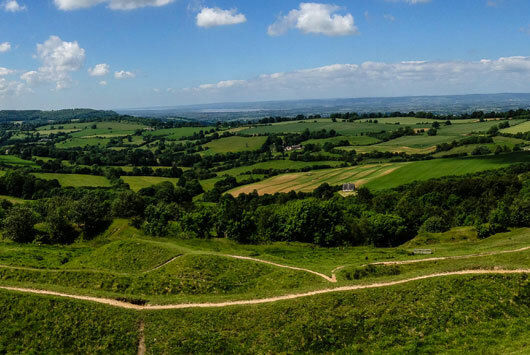 The road to Gloucester via Stroud was indeed hilly and very painful! We made it though spurred on by the fact that it would get flatter. After getting lost in Gloucester and some lunch in another field we began the last 40 miles or so on the A48. Unfortunately our reliable information turned out to be unreliable, the flat never really came and the hills were relentless! By this time I was struggling to keep the bike going forward, Gary was patient and never once told me to ‘hurry the f*** up.’ Slowly but surely we ate up the miles (along with all the food we could find) and arrived at the course about 6.30. We stood proudly by The Celtic Manor sign and asked a security guard to take our photo – very kindly he refused! Luckily Sarah and Ross were close by. We threw the bikes in the car and headed off to the pub. As satisfying as it was to complete the ride look out for my bike on e-bay. To me, at least, green design makes the difference between good and great golf courses. From big to small, flat to undulating, round to square (ish), heavily bunkered or no bunkers, they should all get the golfer thinking about the approach shot they are about to hit. Drawn and designed at a 1:200 scale because of their complexity, they are accountable for a big chunk of time in the design process. One project for example could easily have 40 or more greens (including practice facilities) to design, each a different size and shape with different borrows to fit the golf hole that is laid out before it. Every green design is painstakingly drawn with a high degree of detail, up to 6 contours per meter. The drawn design is not by any means set in stone, more often than not the Golf Course Architect will tweak (sometimes more than tweak!) slopes, humps and bumps when they are on site. One thing that must be considered as a part of the green design process is creating areas that are flat enough to be ‘pinned’. There should be at least 5 suitable areas on a green for the pin, if, for nothing else, to cover the 4 days of a big tournament. To meet European Tour standards for example a pinnable area will generally have a gradient of less than 2%. Along with Pin positions another aspect to be considered is the type of grass being used on the putting surface, the mowing height and potential Stimp reading as this will have an impact on the slopes and shaping. Generally Greens will be cut between 3-5mm depending on the time of year and during the summer they may be cut twice daily to keep the greens fast. The Stimp meter is a device that allows the Golf Club to gauge the speed of their greens. For Championship Golf they are normally a minimum of 10 feet on the Stimp. 12 feet is usually as fast as a professional golfer would see, Augusta’s Stimp however can run at 13 feet. Now for some very basic construction information. Typically European Golf Design build greens to conform with the USGA recommendations for greens construction. Starting from the bottom upwards; The first job is to shape the green subgrade so that the contours in the subgrade reflect those of the finished shaping. A series of drainage lines are trenched into the subgrade, these will contain the perforated drainage pipe and be backfilled with washed gravel. Above this is a 100mm layer of the same washed gravel. Finally on top of this sits the seedbed mix which is a 300mm mixture of sand and organic matter. Occasionally a plastic membrane is installed around the green perimeter which is used as a barrier between the subsoil green profile edge and the gravel blanket and rootzone mixture. One aspect I have not covered is grass seed. There will be a blog to come on this, so to find out more on Bent or Bermuda, Pencross or Penneagle watch this space! Football is well represented at EGD; it is often at the heart of a heated discussion especially on a Monday morning. Starting in the back of the office we have Gary, a Glasgow Rangers fan, I don’t have much to say about Rangers apart from Gary could probably get in that team at the moment. It also helps getting tickets when your uncle is the Chairman!! Robin and Dave are Spurs Fans. One would be too many. Sleeping Giants? I think they are in a coma. We mustn’t also forget Rob’s first love Halifax Town who languish in the Unibond league. The Man Utd Mug belongs to Matt, he doesn’t like the diving that has come into the modern game and hates Ronaldo’s greasy hair, he was glad to see the back of him. His Favourite Utd player? I would say Wayne Rooney, of course, the toffees taught him everything that he knows. Jeremy is a Gooner, he has not forked out for a mug though. Maybe he is not very proud. Or is it us? Maybe we haven’t seen it like Mr Wenger. Sarah is a part time Liverpool fan, when they lose (quite often this season) she cheers on Fulham. I think she fits in better with the fans in South West London rather than the Merseysiders. She does own a pair of highly one sided Liverpool goggles though. Shara, as far as I know the only team she supports is the one that her sons James and Sam play in. She is probably the most sensible of all of us. Ross – he is a Hammer, currently they are in the relegation zone, the team that put them there last week with a win at Upton Park? Everton , that happens to be my team. The Pride of Merseyside. Stan also likes football, his favourite team? The Chicago Bears. Huh.